Following a strategic reorganization of its product-focused business units, Analog Devices (ADI) needed to build leadership capability within the ranks of its senior employees and increase the strength, depth and readiness of its bench. The creation of the new complementary divisions required ADI to develop a bench of leaders with both the technical skills that had taken ADI to the top of its industry and the financial and business acumen essential to the competitive pressures of a market-driven business. Many of ADI’s engineers were long-time employees with many decades with the company. Others were new to the company. Both needed stronger skills to lead the organization forward. In this time of transition, ADI turned to TRI Corporation, known for its ability to build senior leadership capability and capacity. Leading from a team mindset—understand that they are only as good as their teams and how to manage strengths and weaknesses. At the same time, TRI knew that ADI was not going to be an easy crowd to please. “We seek vendor partners who can bring best-in-class learning experiences and exceed the expectations of our highly capable, well-educated population,” Dupere said. Together, ADI and TRI designed and developed the ADI Business Simulation, a shared experience for high-potential corporate leaders that provides opportunities to acquire and practice business skills via an authentic business simulation, peer coaching and feedback. In a week of intense 10- to 12-hour days, teams of five to six participants compete to take a struggling company to profitability in six “quarters.” Along the way, they participate in plenary sessions with Analog top executives and peer feedback based on ADI competencies such as execution, financial acumen, decision making, acting strategically, market/customer focus, leading people, influence, and more. The simulation is a unique practice field for leaders to experience managing a business and seeing the consequences of decisions in a compressed timeframe. They can make mistakes and learn from them without dire company or career consequences. In addition, at the beginning of the week, participants each create a Personal Development Plan (PDP) with at least two leadership competencies to work on, have observed, and get feedback. They also select at least one competency area that they excel in and can use to help their team. Team members share their PDPs with each other. During the week, each participant observes and takes daily notes on the behaviors of one teammate for a final team PDP feedback session. Each also is asked to share observations and feedback on other team members. At the end of the business simulation, participants share with each team member what went well and what needs improvement vis-à-vis their individual PDPs. Feedback focuses on things each leader-in-development should continue to do and things she or he needs to be aware of and do less. 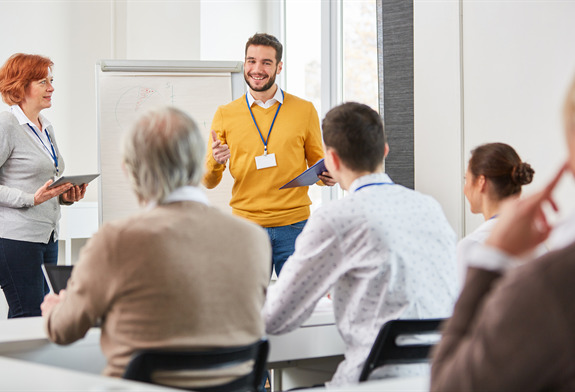 Participants have reported that peer feedback is a particularly powerful session for them, often times more so than a traditional 360 or feedback from their boss or subordinates. Peer feedback, also called peer coaching, developed as a cost-effective way to provide quality coaching to mid-level, high potential and emerging leaders. Marshall Goldsmith, a world authority on helping successful leaders get even better, notes that peer coaching creates sustainability and reduces the cost of training by involving each participant as an equal partner in the process. Each participant acts as both the coach and the coached. The result is a more collaborative leadership base committed to continuously becoming more successful. One of the most common complaints on employee surveys, TRI reports, is “My boss does not give me timely and candid feedback about my performance.” Peer feedback helps new leaders overcome this barrier to development. The ADI peer feedback sessions are combined with training on two-way communications, effective communication, and active listening. More than 150 people have completed the Analog Devices Leadership Program, which includes high potentials from every geography and business unit. ADI now has a solid curriculum for its “high potentials” that is accelerating the readiness and confidence of its leadership bench. All of the leaders in new segment jobs have completed the program and have successfully transitioned from engineering roles to their new market-facing roles. “The peer feedback gave incredible insight into concrete areas to develop both personally and for the organization,” one participant reported. Another credited the feedback session with helping improve communications by becoming more aware of the people he is communicating with. Dupere, who had newly joined ADI and was charged with creating an organization development practice, including development of a leadership curriculum and a global succession management process, points to the high caliber of the TRI team and the rigor of the simulations as keys to the learning of the participants. Within three years of the first program, Dupere reported, the number of individuals on the ADI leadership bench increased fivefold. “That increases internal mobility and strikes a good balance between strategic external hires and promotion from within,” she said. ADI now has greater engagement by leaders of all levels in developing and empowering others. The PDPs and peer feedback, in particular, have helped leaders strengthen their internal networks and has created a shared knowledge base within the bench.